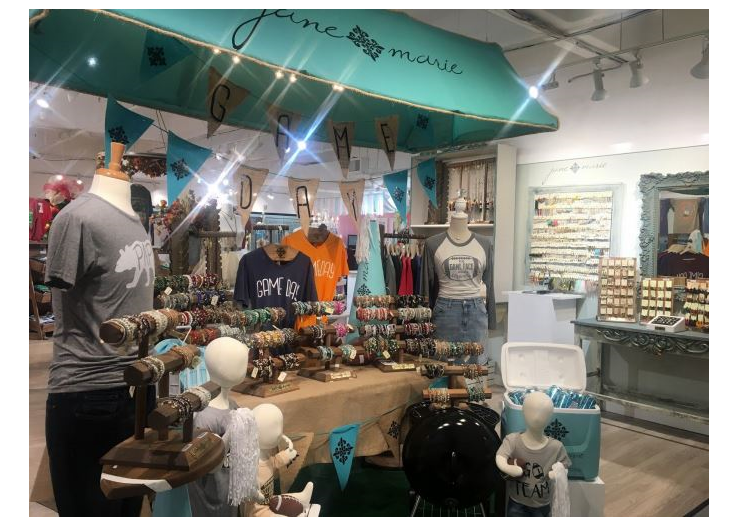 Staying true to your identity isn’t always easy in the fashion industry, but Jane Marie owners Janie and Jeff have found a way to stay true to their roots while offering trendy and affordable clothing and jewelry for children and adults. 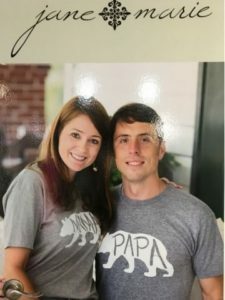 Self-described as “rustic, shabby, chic,” what started as a charm company in 2014 based in Northern Louisiana has grown into a booming business over the past four years. Since its launch, the brand has expanded into tees and tanks for moms, dads and their mini me’s. This year, for the first time ever, they will also offer sweatshirts and pajamas for the whole family. With classic southern slogans like “Lord Willin’ and the Creek Don’t Rise” and “Y’all Ain’t Right” proudly printed on their apparel. It’s no wonder why Jane Marie has charmed their way (no pun intended) from the showroom right onto buyer’s shelves. 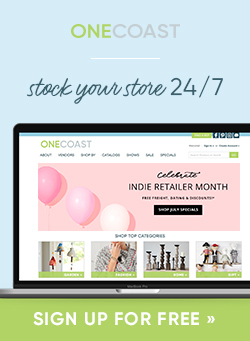 OneCoast is home to Jane Marie’s showroom and had the opportunity to see the magic behind the scenes. Here is a sneak peek of their fall/winter 2018 show setup and what the OneCoast visual team has had the pleasure of creating over the past few months. Although the show doesn’t happen until July, planning starts months in advance. 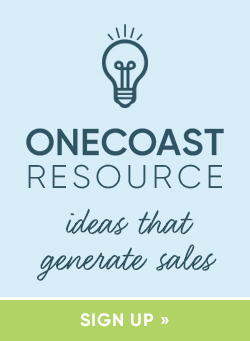 This season the OneCoast team started in March by partnering with Jane Marie and brainstorming creative ideas for small scenes called vignettes. The vignettes correspond with the season and vendor product the company is trying to sell, and the goal is always to be the best of floor. 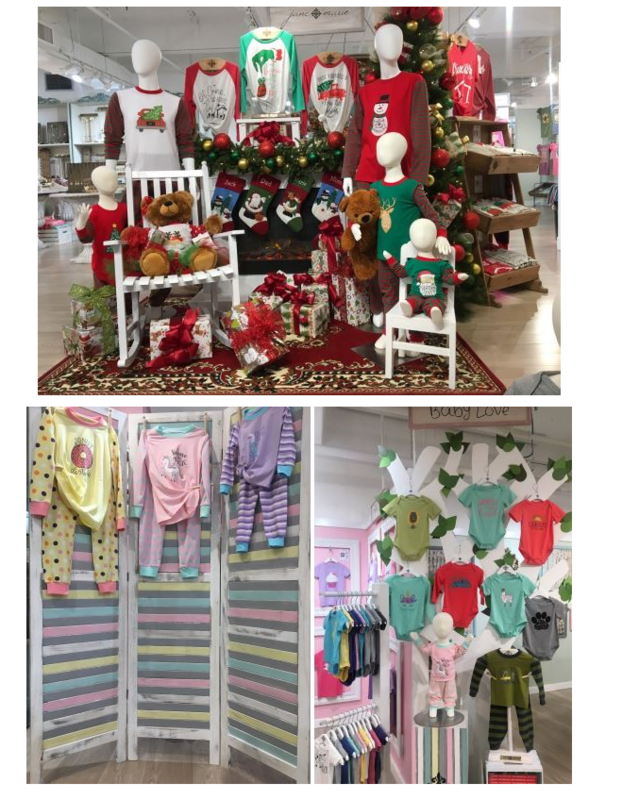 This season Jane Marie’s product categories included their staples of jewelry and tees, but also specific themes for holiday, fall, and football season which were the focus. Once we have a game plan, the duration of set up is spent executing those ideas into what you see in the showroom during market. We begin by scouting for the props necessary to make the space come alive, matching paint swatches to anything that may need to be crafted, and taking measurements to ensure that the vignettes stay within their footprint. 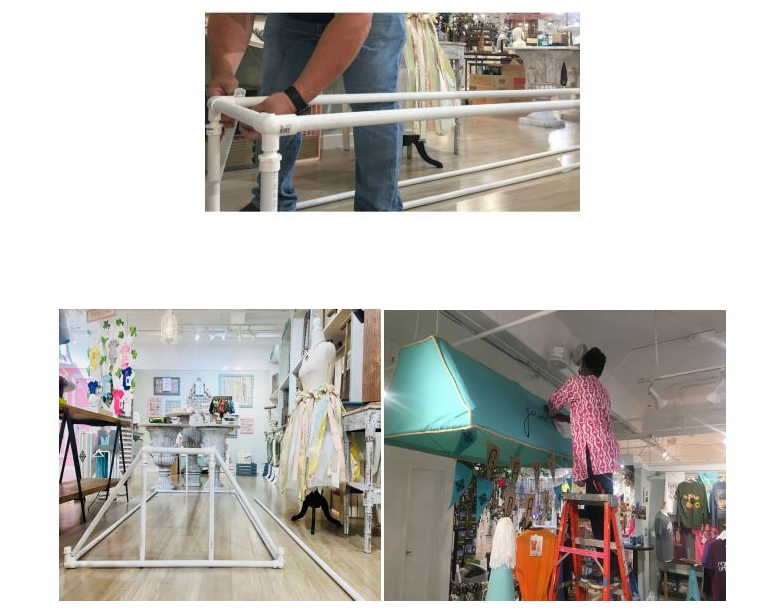 Many of the displays you see on the floor are hand made by a OneCoast or Jane Marie team member, always keeping in mind the functionality of the space and access to the product. One of the biggest projects this season was the “Gameday” vignette. Since it is the first vignette the customer sees, it was imperative that it had the “wow” factor. After searching for the perfect aqua blue for the various props, the team came up short, so everything was made in-house from the megaphones to the utensil caddy. The canopy itself was a huge project, and was assembled using PVC pipe and fabric. The vinyl logos were then custom made and ordered and placed onto the canopy to make it pop. 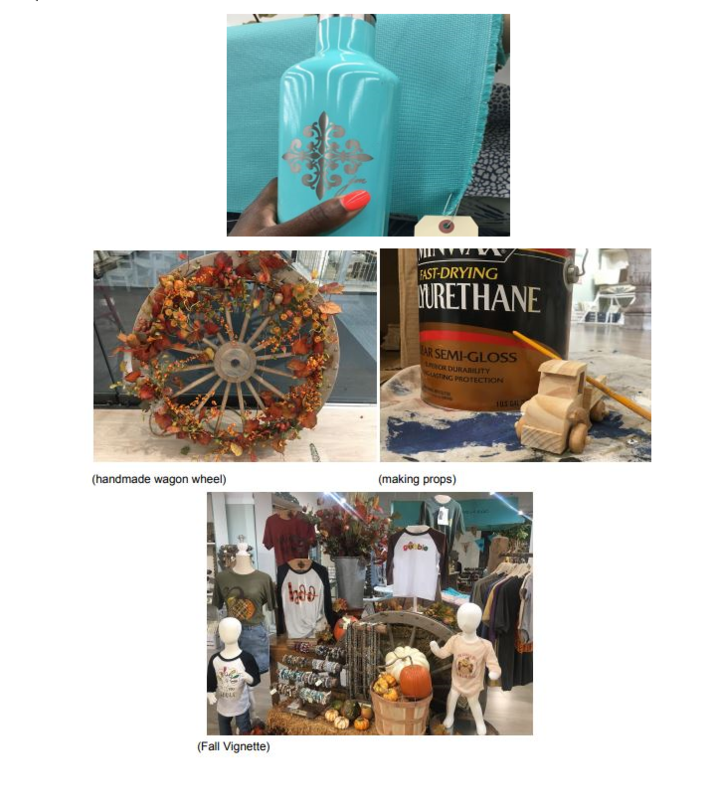 The final touches were the addition of the Jane Marie adorned megaphones, cooler, football themed apparel, and of course, all of the new fall Stack-Its that Jane Marie is known for. The addition of Christmas and kid’s pajamas were also a big and exciting project this setup. The launch of a new product is always exciting and the pressure to make something that could stand out was challenging. However, the end result was a fun spin on a traditional family holiday, and exceeding the expectations of the team. The final piece to this show’s setup was product placement and the new “Inspiration” vignette that focuses on breast cancer awareness. Just Jack, the brand’s boy’s line, also received a makeover in the form of a jungle gym, and lastly, the team created a stellar atrium display showing several new gorgeous fall designs and colors for the jewelry collections. Once the atrium is set, it’s Showtime! OneCoast and Jane Marie hope you enjoy the showroom as much as they enjoyed making it. Share the post "Jane Marie | Keeping It Rural"